We start solving and there he is! Clue 2 ‘Hubristic racer to try finding energy at the end (4)’ That’s a reference to The Tortoise and the Hare fable, isn’t it? The proud speedy hare being defeated by the diligent, plodding tortoise, and ‘try’ is HEAR with the Energy moving down in the clue. So Poat is honouring his little hero – or is he? 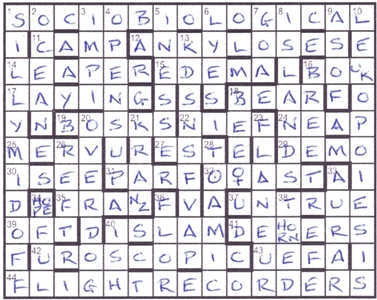 Of course that gave us 14 letters that would stretch right across the grid, as did ORA/IAGO/PARITOR, ETIOLATE/OCTETS and CITHER/LETRASET so we had a starting point for our gridfill. We worked out how to enter HASTEN/WOOLCOMBERS in a total of four different columns and established the position of our first obstacle. AERIEST and FLATTERING clearly had to go off at 90° angles and they gave us our second. And so it went on. With an almost full grid and a second putative HARE appearing at the foot of the tenth column, we sussed that THE FASCINATION OF SHOOTING was to fill those alternate perimeter cells. SURELY NOT! Was this going to be Poat’s attempt to wipe out, forever, the memory of the little beast? OWL and TERCELET had appeared. Was Poat going on a rampage ‘MADCAP POTS BAG LOADS’? We have to express a strong objection. Such violence, together with scurrilous terms, sexual references and all the rest of the forbidden guff, should surely be banned from Listener crosswords! With a full (or almost) grid, we had to fit those letters into the gaps and realised that, in order to place all 18, we would have to use the six cells containing obstacles. This was a demanding but enjoyable endgame to produce ten targets and at first the little HARE seemed safe as they were not animals at all but sitting ducks that appeared: SHIELDRAKE, SMEE, POCHARD, GOLDENEYE, SCAUP, SCOTER, EIDER, BALDPATE and wisely beating a retreat, one I hadn’t heard of, a GARROT. That made nine ducks. The potential HARE in column ten becoming just another duck. Surely the goldeneye, scoter, eider and pochard are protected birds. Frankly, this will not do. Google tells me that the hare is only protected in Scotland. That doesn’t seem fair. Number 10? What can I say? Mrs Bradford tells me that a HARELD is a duck, so Poat has brought the little fellow back, just to convert him into a duck and shoot him. Shame! I rest my case! I’m normally fairly good at remembering a setter’s previous puzzles and normally start each blog with a summary of their recent oevres. This week, however, my mind went a complete blank, pretty much like the grid which was a sizeable 14×14 without bars. No doubt Poat’s previous puzzle would come to me before this blog is posted. Here, we had an interesting entry device whereby each clue led to one, two or three answers which were entered inwards until it met the edge of the grid or an “obstacle”. At first, I wasn’t sure whether inwards included diagonally. It soon became clear that it didn’t. The first clue (excluding See 23 at 1) was 2 Hubristic racer to try finding energy at the end (4) and completely eluded me, but luckily 3 Unusually sportsmanlike, foregoing free pass to keep for Boris (7) was more forgiving with KREMLIN, and 4 was similarly straightforward Sturgeon’s intending change of title before new government (7) for ETTLING. All in all, the clues were good fun, especially the likes of 12,29 Secretly broadcast opener of Two Ronnies (8, two words) for INTER NOS. There were also some tricky ones, such as 15-2 Young McGill student? Cheeky with a change of heart, showing internal transposition, straight to this point (5;6) leading to FROSH and HERETO (HE-TER<-O). Once the grid was finished, apart from a few empty cells, the perimeter yielded THE FASCINATION OF either SHOOTING or, more likely I thought, SHOPPING. Unfortunately, Google didn’t have anything exciting for the latter although predictably it had lots of images of shops and also, less predictably, a discarded shopping trolley. In fact, the puzzle was based on a quotation from P.G. Wodehouse’s The Adventures of Sally: “The fascination of shooting as a sport depends almost wholly on whether you are at the right or wrong end of the gun.” But what were the ten thematic elements that we had to find in the grid. Having seen some disgusting images of armed white hunters standing over dead elephants and lions, I hoped they were not the targets. Seeing GOLDEN EYE, soon enabled me to narrow my search down to types of duck. The empty squares in the grid, including the six “objects”, had to be filled and the ten ducks highlighted. This was fairly straightforward given the letters provided by the preamble, MADCAP POTS BAG LOADS: GOLDEN EYE, EIDER, SCAUP, BALD PATE, GARROT (backwards), SCOTER, HARELD, SMEE, POCHARD and SHIELDRAKE. Good fun from Poat, thanks. But as the envelope to St Albans slipped from my hands into the letterbox, I realised that I hadn’t actually gone back and solved clue 2. I’d originally planned the publication of this puzzle to coincide with the anniversary of Cook’s arrival here in Aotearoa, but then I realised that back in the Old Country, the commemoration of his journey was more likely to happen on the anniversary of his departure. That meant that I had to stop daydreaming and get something down on paper to send to Roger pdq. It would really help if the Royal Mail could send us puzzle setters details of their commemorative issues a couple of years in advance, but I suppose that just isn’t a priority for them. I’m still learning to have realistic expectations when planning a puzzle. My original idea was to combine Cook’s voyage with that of Māui, who fished the North Island out of the ocean and left it behind (along with his canoe) for Cook to “discover” many centuries later. Of course there just isn’t enough room to do that in a realistically sized grid. The other constraint, if I wanted my map to be realistic, was that I couldn’t reference too many significant points on the Endeavour’s journey: most of them are all scrunched up in the middle of the grid. That meant that I couldn’t make any reference to Australia — I’m so sorry about that 😉 . I did spend a long time thinking about the correct form of the code word: HMS Endeavour or HM Bark Endeavour? Perhaps the latter is more correct, but I worried that it was also more obscure. I was finally convinced by re-reading Patrick O’Brien, who assured me that any boat with three masts was entitled to be called a ship, so HMS it was. Many thanks again to Roger and Shane for all of their help in getting the puzzle up to scratch. They did – quite rightly – rule out one of my clues for using a neologistic anagram indicator: “Prickly Ned’s end on Game of Thrones cut”. If anyone can find a way of making this work then I’d love to hear from them. Also, in case you were wondering, I don’t have any plans for another Playfair puzzle (well, not for a while anyway). Nō reira, tēnā koutou, tēnā koutou, tēnā koutou katoa. This was only the second Listener from Agricola, following on from Heisinger, Schrodinger and his cat last year (The Code Duello). That had two Playfair codes at its heart. Luckily, for those who don’t like them, this puzzle had only one. However, it was of the type where the code word has repeating letters which I guessed might make it a little trickier on the deciphering front. A golfing holiday approached, so no time for much detail this week. Suffice it to say, it was a thoroughly enjoyable solve. It wasn’t too long before the UK to NZ theme popped out together with the two capes, Horn and Hope. The Captain Cook theme was pretty straightforward, but it took Wiki to remind me of his observation of the transit of Venus. Even the Playfair code square could be deduced from the preamble — HMS END[E]AVOUR. If that wasn’t obvious, the encoding of 17 and 37 across was given, which I assume gave enough information to work out the code on their own. All that remained was to move the astronomical symbol for Venus from the left to the right of that for the Sun with the F replacing it. (I checked with the notes for Mynot’s Stomach puzzle in 2016 to see what the accepted symbols were. I know there were alternatives, but I think most were accepted.) This gave JAMES COOK encoded in the central column as KDSNSFVAP. The puzzle included two Capes – HOPE and HORN – which were both rounded to the South on the voyage. Though for me Banks immediately makes me think of the author Iain (M) Banks, this Banks was Joseph Banks, who was on board HMS ENDEAVOUR, along with Captain JAMES COOK & Co. Thus this clue worked well as an intro to the puzzle and a clue that parsed as So.+C+IO+B+IO+LOGICAL – at least that was my interpretation! it can be confusing until, like in G8, you realise that ‘group of’ can be replaced with the letter G. So the clue structure here is Wordplay Definition, with no linkwords, parsed as OVERDO (go too far) + G (group of). It looks to be the adjectival meaning of OCEAN, i.e. Marine, but at first sight the charade-based wordplay doesn’t seem to deliver all the correct letters. Until you parse it as OC+E+À+N, that is! 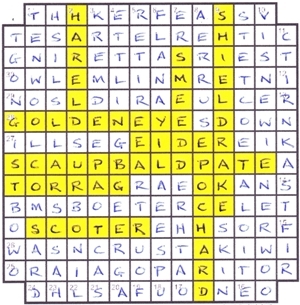 I noticed that the 8th row of the completed grid did contain VA?N. Might Agricola be going for the Ford Transit Van* pun, with Venus (the symbol) ending up ‘in’ the VAN as VA(Venus_symbol=♀)N? That would be ‘In Transit, as the Title suggests, wouldn’t it? I did spend a few moments wondering if the movement of Venus around the Sun might end in this cell. However, the F wouldn’t appear in the right place in the Playfair-encoded 13d, so a simple ‘horizontal’ transit must be what Agricola requires! *Aside: is it only me that, whenever seeing Van, is reminded of the R4 comedian Arthur Smith’s version of Kipling’s ‘If”? Um, yes, probably! And, which is more, you’ll be a van, my son.